Conceptis Fill-a-Pix are exciting, language-independent logic puzzles that form whimsical pixel-composed pictures when solved. Challenging and deductive, yet easy to learn and artistic, Conceptis Fill-a-Pix offer the ultimate mix of logic, art, and fun, while providing solvers with many hours of mentally stimulating entertainment. It was the late 1970s, soon after he began contributing to Games & Puzzles Magazine when the idea started incubating in his head. Trevor Truran, today the editor of the famed Hanjie magazine published by Puzzler Media Ltd. UK., was then a former high-school teacher looking for new excitements. According to Truran, the basic concept which led to Fill-a-Pix puzzles as we know them today arose from his interest in one of John Horton Conway's mathematical recreation, known as the Game of Life. Horton’s Game of Life used the concept of considering a cell and its neighbors to determine which cells 'lived' and 'died' over several generations. “Among my quota of ten new puzzles a month were a few based on the idea of a cell and its neighbours” Truran says in his article The Path to Fill-a-Pix. “These were not picture-logic puzzles but rather brainteasers and usually from some information in a grid the solver had to fill in the next line. Often the puzzle depended on looking at two or three neighbours of a square that were directly above it or of looking at the neighbours all around a square”. Truran then thought of an idea to create “a grid of squares completely filled with numbers - from 0 to 9 - where each number tells how many of its cell and its neighbours had something in them - but, having filled in the squares there had to be some result other than a random group of splodges”. He named these puzzles "internal-referencing", distinguishing them from the cross-referencing puzzles where the information is outside the grid that he was also developing at that time. Yet, having virtually no ability to form mental pictures, only logical constructs, Truran did not consider brightening the idea up with picture puzzles. “I stuck to squares and, to give a "purpose" to the puzzle - created maze-related concepts”. The two main puzzles were then named by Truran Bog Hopping and Bang To Rights. The idea to have these puzzles forming pictures eventually arose when Truran experimented with grids containing triangles and hexagons. First, a few oddball cartoon picture puzzles were made - including Snake Sliding Over a Razorblade!. Then Truran understood that the pictures idea would work if the numbers were inside the grid and the neighbours' principle applied. At this point, the only way to create this type of puzzles was to calculate them manually. According to Truran one of the main problems with his hand-compiled puzzles was that it simply took too much time and tedious work to make the solution unique. It was also almost impossible to determine precisely how many squares need to have numbers in them. “In early attempts such as Admirable Portrait” Truran wrote, “either every cell was given a number, or every second cell. After several attempts and changes a unique answer could be proved to exist, but the puzzle was weak in that it contained redundant information. In addition, it was simply uneconomic to spend so much time manually creating a relatively small product. At the end of 2001 Truran sent some prototypes of his concept to Dave Green, president of Conceptis. The prototypes were still "raw" at that time - the pictures were not very clear and the clues were placed in chess-board configuration with a number in every second square. However, according to Green, he could sense the fun which this concept has to offer immediately when started solving Truran’s first prototypes. It wasn’t long until Conceptis decided to invest its resources to further develop it into a mainstream computer-generated game. 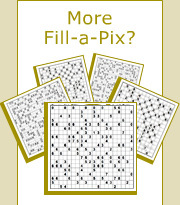 About one year later, in February 2003 Conceptis announced Fill-a-Pix, a new type of logic puzzle forming pixel-composed pictures when solved. The first company to recognize the merits of Fill-a-Pix was G-mode, Japan's leading mobile game-services provider. In March 2003 G-mode announced the release of Conceptis Fill-a-Pix puzzles for NTT DoCoMo mobile phone subscribers in Japan. Locally branded as Nurie-Puzzle, G-mode started offering the new game to customers with iMode Java enabled phones and later on expanding to KDDI-AU and J-Phone, the other leading mobile systems in Japan. By June 2003, Fill-a-Pix puzzles start making their way to some mixed-puzzle magazines in the Netherlands, Germany, UK and Japan, and in October 2003 they are presented for the first time in the World Puzzle Championship, which took place in Arnhem, the Netherlands. In March 2004, Mozaic, a bi-monthly Fill-a-Pix magazine by Puzzler Media Ltd. becomes available in WHSmith shops in the UK and to subscribers worldwide. Today, puzzle magazines with Fill-a-Pix by Conceptis are published regularly in over 35 countries including USA, Japan, the UK, Germany, Holland, Canada, France, Russia, Poland, Finland, Denmark, Israel, Hungary, Austria, Spain, Norway, Sweden, Greece, Switzerland, Belgium, Italy, Australia, New Zealand, Czech Republic, Brazil, Turkey, Korea, Thailand, Romania, Philippines, Estonia, Latvia, Peru and more.